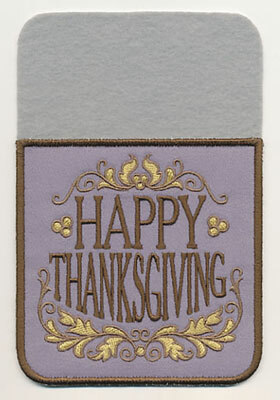 Celebrate family, friends, and all the blessings in life with new designs full of gratitude and thanksgiving. 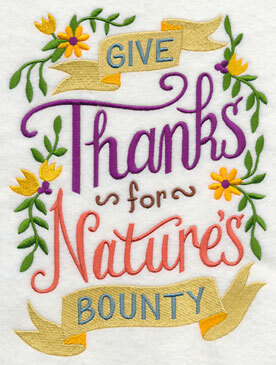 Show appreciation for the best life has to offer with tea towels and placemats embellished with the sweetest of sentiments. 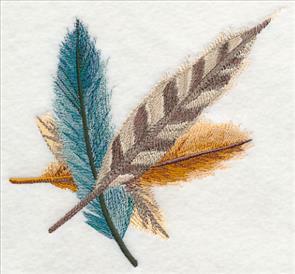 Gorgeous leaf and feather motifs will bring autumn cheer into your home. 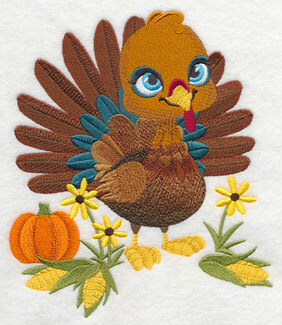 And, designs featuring November's favorite feathered friend will help you celebrate turkey time. 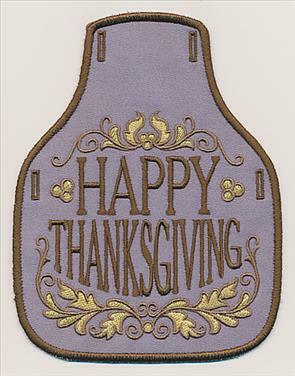 Set your table for Thanksgiving with new in-the-hoop silverware pockets, and "wrap" bottles of wine or cider with embroidered aprons. 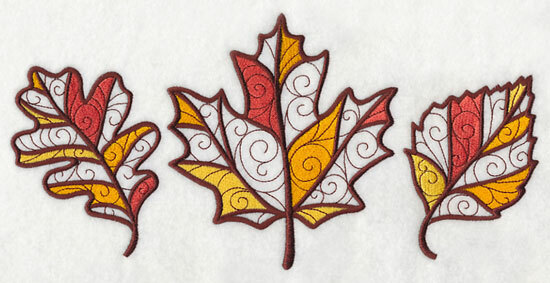 Leaf coasters and a turkey napkin holder are brand new today, and stitched entirely in the hoop, too. Bring a joyful look to your home and table with these new designs. Scroll down the page to see them all! 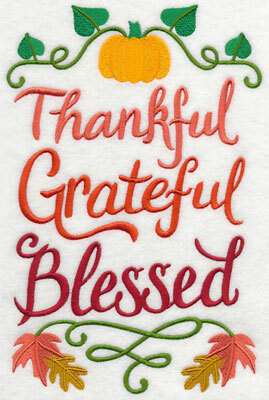 Stitch words of gratitude on a kitchen towel as a daily reminder to give thanks. 6.85" x 8.57" and 5.87" x 7.35"
6.85" x 9.25" and 5.79" x 7.82"
4.85" x 6.54" and 2.87" x 3.87"
These gorgeous sayings offer up a daily reminder to count your blessings. 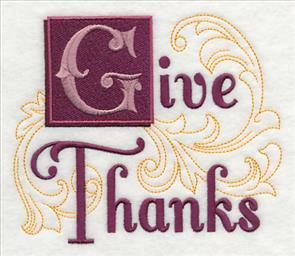 Autumn accents and motifs accompany the words of gratitude on pillows, wall hangings, and mini-quilts. 6.85" x 10.43" and 5.87" x 8.94"
5.13" x 7.81" and 4.51" x 6.87"
10.78" x 6.85" and 9.22" x 5.86"
7.81" x 4.97" and 6.85" x 4.36"
Who's thankful? 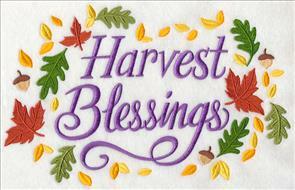 Give thanks for family, friends, and blessings in your life with these sweet sentiments. Stitch their good-natured spirit onto table runners, wall quilts, and tea towels. 8.92" x 6.85" and 7.64" x 5.87"
9.40" x 6.84" and 7.82" x 5.69"
6.67" x 4.85" and 3.88" x 2.82"
Stunning leaves, acorns, and other fall foliage fill this wreath design with the changing colors and striking beauty of autumn. The design has been styled to embody the brushstrokes and coloring of a watercolor painting, and is absolutely gorgeous for pillows, quilts, and more. 7.80" x 7.53" and 7.15" x 6.90" and 6.06" x 5.85" and 5.02" x 4.85" and 3.85" x 3.71"
Varying shades of brilliant gold, crisp green, deep burgundy, and earthy brown capture the gorgeous hues found in the natural palette of autumn. 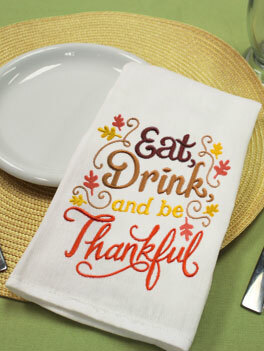 Tea towels, placemats, table linens, and other Thanksgiving essentials get an eye-catching update when embellished with these striking designs. 6.63" x 11.73" and 5.31" x 9.40" and 4.41" x 7.79" and 3.86" x 6.85" and 2.18" x 3.85"
A border design featuring blazing autumn leaves is perfect for repeating down table runners, along the edges of a tablecloth, or adding to a pillowcase. 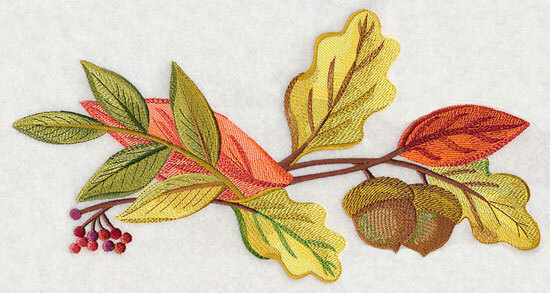 The breathtaking leaves and acorns make these designs terrific for stitching all autumn long. 11.73" x 6.15" and 9.38" x 4.92" and 7.80" x 4.09" and 6.00" x 3.38" and 3.84" x 2.13"
Give a napkin, pocket, or placemat its turn in the spotlight with a matching corner or accessory design. 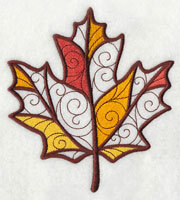 Stitch singly, or use with the rest of these autumn leaf designs on a quilt, set of table linens, or bedding set. 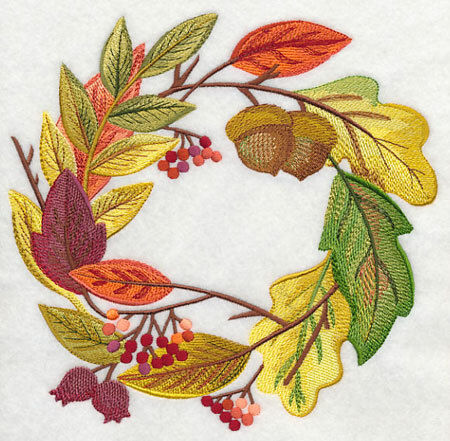 These stunning Autumn Harvest Potpourri designs are a beautiful way to stitch the changing colors of fall on your projects. Pick your favorites by clicking the links above, or get them all in a design pack! Bring a unique look to seasonal decor with beautiful designs featuring stunning feathers. 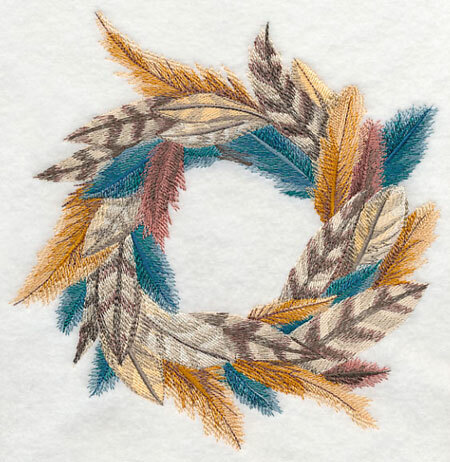 Here, a wreath is ready to adorn a pillow or placemat with its natural elegance and grace. 7.69" x 7.77" and 6.88" x 7.05" and 5.80" x 5.94" and 4.81" x 4.91" and 3.81" x 3.86"
The beauty of feathers lies in their soft, touchable texture and unique coloring. A variety of feathers gives this spray a striking, colorful look within the traditional autumn color palette. 5.32" x 11.73" and 4.26" x 9.39" and 3.53" x 7.76" and 3.08" x 6.85" and 1.72" x 3.84"
Border designs are favorite additions to placemats, table runners, and bed linens. 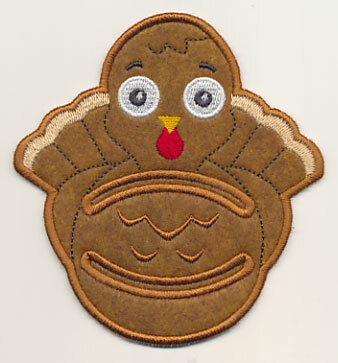 Stitch it alone, or use with the other fanciful feathers to create a matching set. 11.75" x 4.35" and 9.37" x 3.44" and 7.79" x 2.87" and 6.00" x 2.26" and 3.87" x 1.64"
Finish off the collection of sophisticated feather designs with a matching corner and accessory. 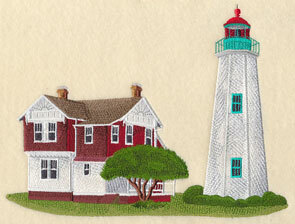 They're exquisite additions to pockets and napkins, or to add extra detail to your embroidery. Add the majestic feathered designs to your kitchen and home decor this autumn. The wreath, spray, border, corner, and accessory designs can be ordered singly by using the links above. Or, buy them all in a design pack at this discounted price! 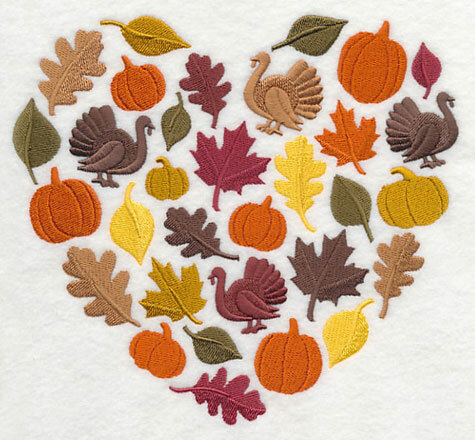 Turkeys, leaves, and pumpkins fill this heart silhouette with fabulous fall flair! 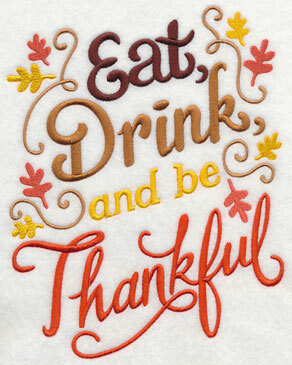 Not only are the accents Thanksgiving-themed, but the gorgeous range of colors used in this silhouette design are perfect for the season, too. 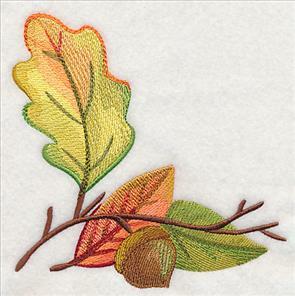 7.55" x 6.90" and 6.41" x 5.86" and 5.32" x 4.85" and 3.86" x 3.52"
A trio of filigree autumn leaves is a gorgeous way to update tote bags, sweatshirts, and pillows for fall. 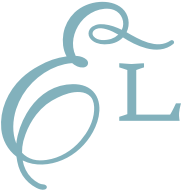 The trio features an oak leaf, a maple leaf, and a birch leaf, and uses filigree detailing to give it an elegant, intricate look. 11.00" x 5.36" and 9.42" x 4.59" and 7.82" x 3.81" and 6.87" x 3.35"
Each of the leaves from the above trio have been separated out, and are also available for individual purchase. 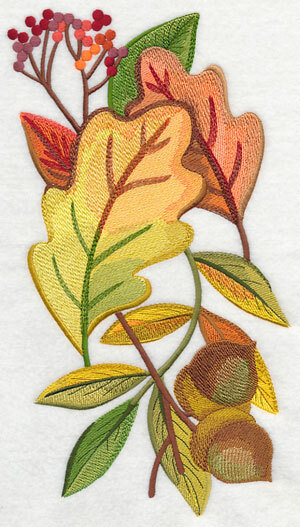 Pick your favorite to stitch alone, or use in conjunction with the leaf trio. 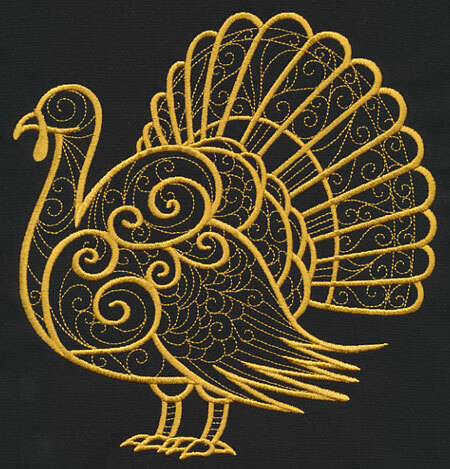 2.83" x 3.86" and 1.77" x 2.41"
Intricate filigree detail and exquisite gold thread gives this Thanksgiving turkey an elegant, chic appeal. A variety of thicker and thinner stitches adds texture and depth to the design -- stitch on pillows, placemats, or framed pieces. 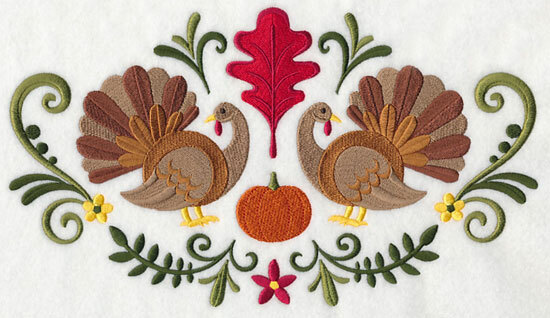 7.38" x 7.82" and 6.64" x 7.04" and 5.87" x 6.22" and 4.86" x 5.14" and 3.66" x 3.88"
Modeled after traditional folk art, this design features classic Thanksgiving motifs, symmetry, and decorative flourishes to impart a whimsical charm. 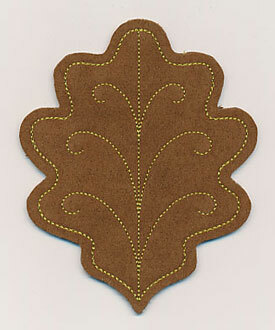 Stitch it as a placemat for your dining room table, or add to your home decor on pillows, aprons, or blankets. 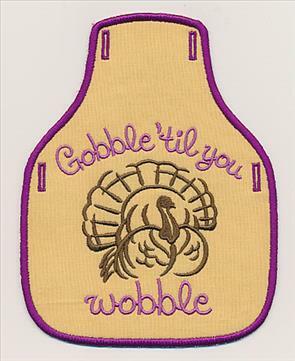 11.70" x 6.63" and 9.40" x 5.33" and 7.81" x 4.43" and 6.89" x 3.91" and 3.89" x 2.63"
Add a cute and charming look to your Thanksgiving decor with these adorable turkey designs! 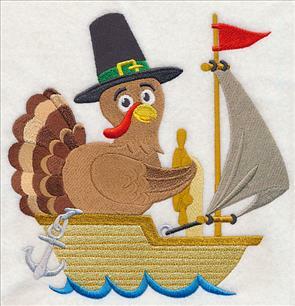 A sweet and soft turkey is a too-cute addition to pillows, kids' gear, and wall hangings; a pilgrim turkey takes a trip on the Mayflower. 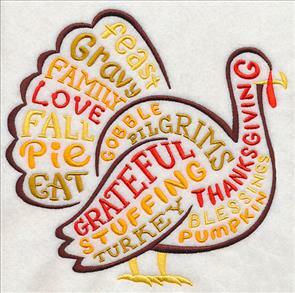 6.77" x 7.79" and 5.83" x 6.70"
7.74" x 7.81" and 6.85" x 6.91"
Thanksgiving words fill this turkey silhouette with some of the best parts of the holiday, such as "family," "blessings," and "pie". 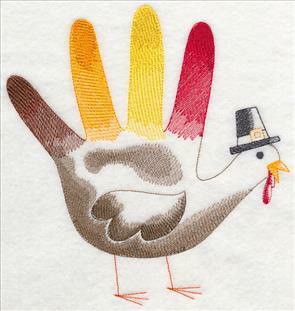 Or, stitch a turkey hand sketch that's been styled after the classic kids' Thanksgiving artwork. 7.82" x 7.66" and 7.00" x 6.85"
6.00" x 5.87" and 4.96" x 4.85"
7.45" x 7.79" and 6.75" x 7.06"
5.85" x 6.12" and 4.88" x 5.10"
Yum...this Thanksgiving, pour gravy on everything! The tasty design is perfect for tea towels, aprons, and other kitchen gear. 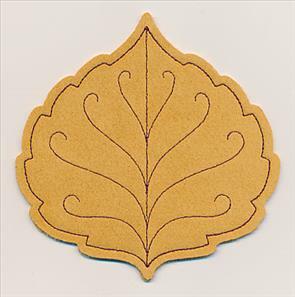 Or, add a simple filigree pumpkin design to placemats, table linens, and apparel. 7.81" x 7.52" and 7.13" x 6.86"
6.09" x 5.86" and 5.05" x 4.86"
11.02" x 4.46" and 9.42" x 3.81"
7.82" x 3.17" and 6.87" x 2.79"
A sweet turkey napkin holder will add a charming look to your Thanksgiving table! The in-the-hoop napkin holder is available in two sizes. Project instructions demonstrate how to make the holder, as well as information on napkin sizing. Click here for more details. 4.37" x 4.66" and 3.65" x 3.90"
Set your table in style this Thanksgiving with new in-the-hoop silverware pockets, bottle aprons, and matching designs! It's a great way to whip up an entire dining table set in no time. 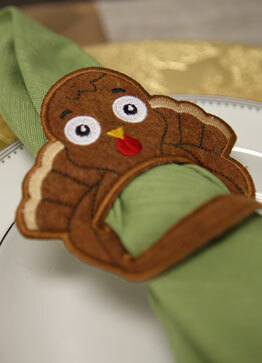 If you're hosting this year, stitch a silverware pocket for each guest with a matching placemat or napkin. Or, bring a bottle of wine or sparkling cider adorned with a bottle apron for this year's hostess, or as a gift for friends and family. 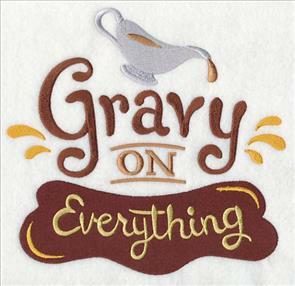 Click here to learn how to make the bottle aprons, and here to get the free tutorial for the silverware napkin holders. 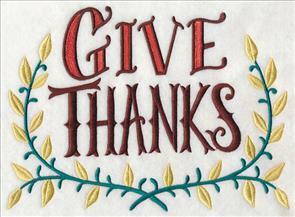 Add a traditional look to your dining room table with a set of "Give Thanks" designs. Stitch a silverware holder for every guest on your list, then gift them a bottle of wine or olive oil to take home with a matching bottle apron. 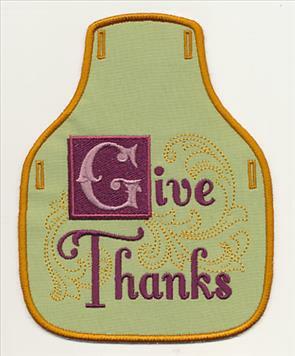 Adorn placemats, napkins, or tablecloths with a matching motif of the "Give Thanks" designs. 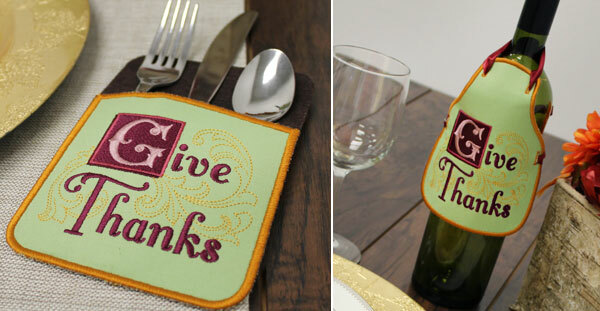 The tasteful flourish and typography will bring a sophisticated appearance to your dining table. 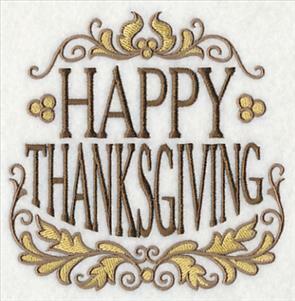 5.69" x 4.81" and 3.85" x 3.26"
Wish your friends and family "Happy Thanksgiving" with elegant, graceful designs featuring the warm-hearted phrase. A lavender and chocolate color combination is a contemporary alternative to classic Thanksgiving color palettes, and will add a stunning, yet unique, appeal to your holiday table settings. 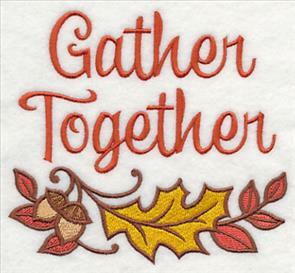 Stitch this "Happy Thanksgiving" design in conjunction with the in-the-hoop designs above, or use alone on mini-quilts, wall hangings, placemats, or aprons. 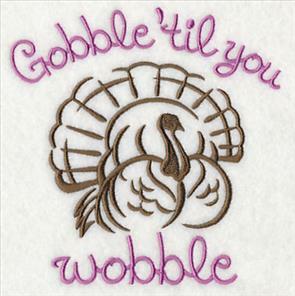 4.83" x 4.87" and 3.83" x 3.86"
Evoke a more light-hearted, fun-loving air to your Thanksgiving decorating with a "Gobble 'Til You Wobble" group of designs. The silverware holder and bottle apron are stitched entirely in the hoop, and are unique additions to any table setting. Use this single design on apparel, napkins, tablecloths, and more to accompany the in-the-hoop designs above. The turkey silhouette adds even more Thanksgiving appeal to the design. 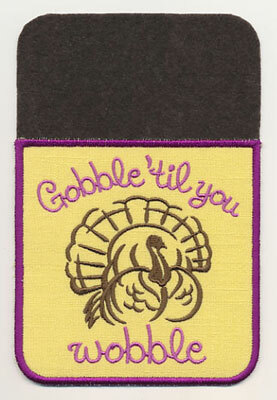 4.85" x 4.99" and 3.73" x 3.84"
Thanksgiving is a time when friends and family gather together to eat, give thanks, and reminisce. Use these dining table designs from September to November to celebrate fall and Thanksgiving. 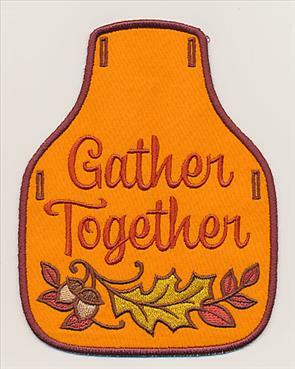 For more embroidery inspiration for your dining table, page through the Gather 'Round the Table Lookbook here. 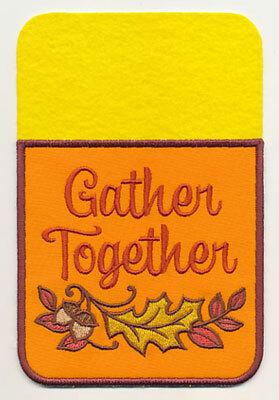 Add this design to quilts, mug rugs, wall hangings, and more as a daily reminder to keep loved ones close. 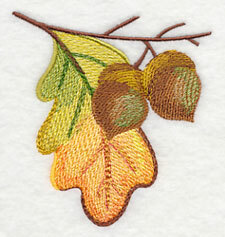 The acorns and leaves are sweet fall accents in this embroidery design. 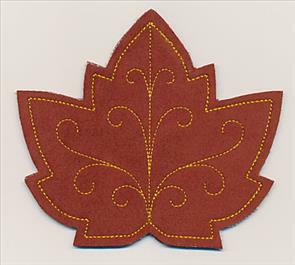 5.32" x 4.82" and 3.89" x 3.52"
Gorgeous leaf coasters in rich autumn colors are an elegant addition to your dining table. Not only do they protect your table from drips and spills, but they're a stunning way to bring the beauty of autumn into your home. Learn how to make the in-the-hoop coasters. 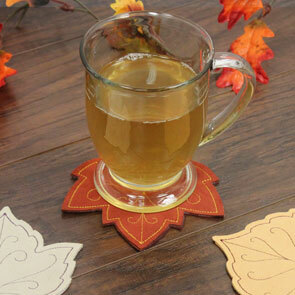 Each of the four different types of coasters comes in two sizes, and is stitched in the shape of a classic fall leaf. Here, a maple and birch leaf are shown; below, a grape and oak leaf. 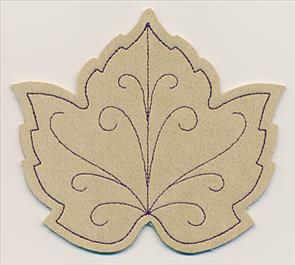 4.77" x 4.85" and 3.78" x 3.84"
Light filigree swirls give added detail to the coasters; ultrasuede fabric provides a gorgeous, no-fray look that embodies the beauty of natural autumn leaves. 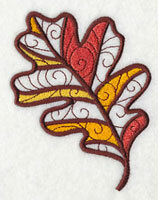 Stitch with our heirloom applique autumn leaves to create a coordinating set of dining table decor. Get the free project instructions for these in-the-hoop coasters. 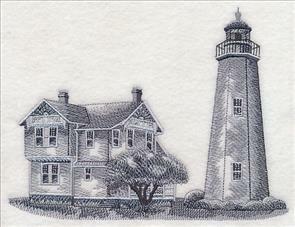 3.92" x 4.86" and 3.10" x 3.85"
April wrote in to request this terrific addition to our growing collection of lighthouse designs. The Old Point Comfort Lighthouse is located on Fort Monroe in the Virginia portion of the Chesapeake Bay, and it currently used by the U.S. Coast Guard and U.S. Army. Thanks for the suggestion, April! 9.12" x 6.90" and 7.73" x 5.85" and 6.41" x 4.85"